It had rained hard the night before and the mud in the wide parking area squelched under my tires as I pulled in to the Waldo-Takilma Area of Critical Environmental Concern (ACEC). A few white government vehicles, a trailer, and an SUV were already there and unpacking their supplies for the day of dirty work ahead of us. I had never visited this ACEC before, despite having lived and worked in the Illinois Valley of Southern Oregon for almost three months. It seemed ridiculous that I had initiated, coordinated, and was about to execute this volunteer day without ever having set foot in Waldo-Takilma ACEC until now—a late November morning under dense clouds and a thin sheet of mist. I took a deep breath, fervently hoped that this, my first real event during my RARE AmeriCorps position, wouldn’t be a total bust. Then I hopped out of my car and got to work. The team of botanists and field technicians from the Bureau of Land Management were hefting gnarly looking equipment to three of the nine work sites we would be planting in. 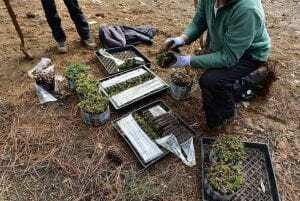 One of their white trucks was filled to the brim with over 3,000 plants. All native species, and all for this huge, neglected, magnificent preservation. And by 9:45AM, the community began to arrive. The sun finished burning through the clouds after the third, fourth, fifth cars pulled into the lot. Everyone was ready for the rain and in high spirits, decked out in waterproof coats, pants, and many a wide-brimmed ha t. The group of nearly 30 volunteers huddled up for brief introductions and a safety check-in, and then we were off, piling into the white truck beds and holding on for dear life as the BLM team maneuvered through gutted trails and rain-sliced potholes. 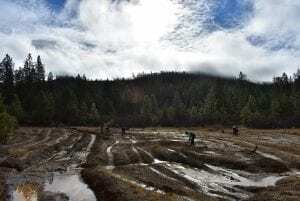 The mist retreated higher into the surrounding Siskiyou Mountains as our team tackled each swath of damaged land, digging a hole for every plant. The rain had worked up the heaviest, stickiest, meanest mud I have ever trudged through in my life, but I was surrounded by some of the most determined folks I could imagine. After four hours of work, we wearily made our way back to the entrance, where we were met by a bus load of 25 bright-eyed volunteers—local school kids from the science club. For the rest of the day, the Waldo-Takilma ACEC was filled with the sounds of shrill satisfaction as mud was flung and another couple hundred plants made it into the ground. The mist was starting to drag its way back down the darkening mountains when the bus pulled away. I stood in the lot, flabbergasted, listening to the ecologists’ upbeat banter about Douglas firs and trying to wrap my head around the day. Around the success of this event, which would bring another dozen Illinois Valley residents into the fold of our volunteer program. I was overwhelmed by the pride I felt for my community. Though this was not a revolutionary day, and building long term health for the watershed was months and years away, I had witnessed the power of this place. The people showed up for what they care about: their home, their neighbors, and their future. And I knew I could count on them to keep showing up. When I began RARE, I feared that the obstacles already burdening rural communities would mean that people would have no time or interest in volunteering. However, every day in the Illinois Valley has shown me that nothing could be further from the truth, and that this rural community will not be defined by its issues. Though just a stepping stone, the work that was done in the ACEC proved to me that this community is already taking control of their future. I look forward in hope to the rest of my time here, knowing that the programs I help guide into place will be backed by the strength of the Illinois Valley’s residents long after I leave. 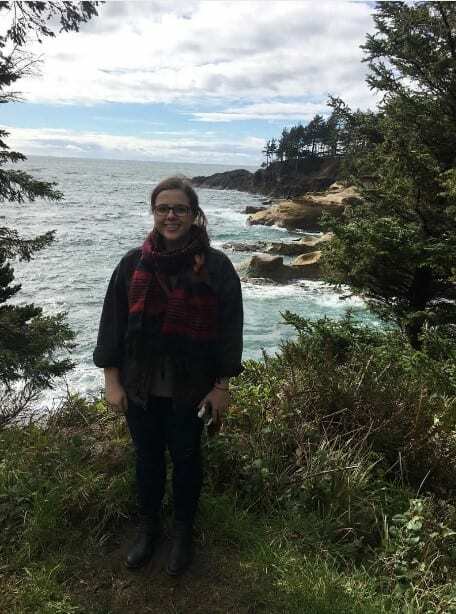 About the author: Originally from Massachusetts, Sienna Fitzpatrick recently graduated from Loyola University Chicago with a BA in Environmental Policy. While living in Chicago, she worked and learned alongside diverse communities which shaped her interest in public service with an emphasis on building capacity and supporting sustainability. As the Volunteer Coordinator for Illinois Valley Soil and Water Conversation District, Sienna works in the office and the outdoors, gaining valuable experience in conservation and community engagement.